Are you feeling uninspired as to what to have for breakfast?! It is the most important meal of the day after all, but most of us would either skip it, replace it with a cup of takeaway coffee or make a half-hearted choice from a bevy of boring options: cereal, egg and soldiers or, even, sensible beans on toast. your breakfast choices will be sweet. I am not aiming to make you jealous. Nothing of the kind. But on a rainy morning when our plan for the day is to paint the walls in one of the rooms, a breakfast like this makes it all worth it to get out of bed. 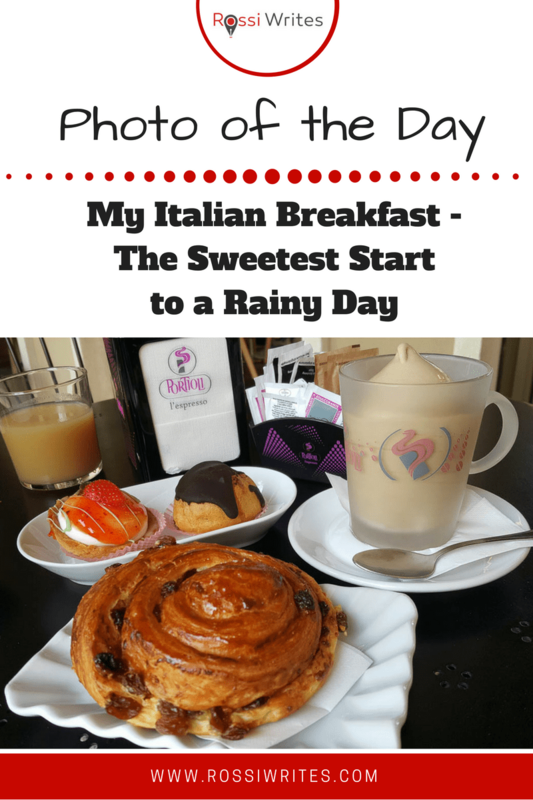 Italians, for all their obsession with the bella figura, usually have sweet things for breakfast. A brioche with a cappuccino is all the rage. I guess, it gives them a bit of a sugar rush to face the day ahead. and, if I am treating myself, I tend to add a tasty dolce (like a tiny cake) to my selection, too. a lovely mini strawberry cake. The perfect, most rounded breakfast, able to make you roaring to go. To paint walls or do any other thing. P.S. The tiny eclair (or beignet as they are called here) was for my breakfasting companion. Come on now, I am not that greedy. Or am I? !